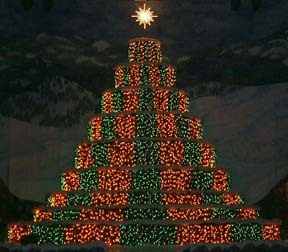 The MidiLite Matrix for Living Christmas Trees or any other matrix lighting. The key to the power of the MidiLite system is properly utilizing it's Matrix. The diagram to the right shows a tree matrix which is 9x9x6. That means it has 9 rows (or tiers), each row is divided up into 9 blocks and each block has 6 colors. This is what we call a Full Matrix which gives you the best effects and most flexibility. With a full matrix, you can do diagonal wipes, randoms, snowflakes and more. It gives you the power to let your imagination and creativity be realized. 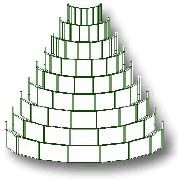 A full matrix uses one MidiLite frame per row of the tree with up to 15 blocks in each row. For a 15 tier tree (like First Baptist - Springdale, Arkansas) you would need 15 frames for a full matrix system. Each MidiLite frame has a (up to) 15x6 matrix in it, which can be the blocks/colors in a row of a full matrix or the columns in a single frame or Odd/Even matrix system (see below). For smaller applications, there are other options for lower-cost starter systems which give you the option to expand later. This is especially true for smaller trees. Smaller matrix layouts are possible by dividing the tree into larger segments. A Vertical Matrix can be used in starter systems, where a dimmer frame controls a "column" within the tree rather than a row (or tier). This allows fewer dimmer frames to be used but still be able to access many of the matrix features. A typical starter system would be a 3x?x6 matrix and then it can be easily expanded later. In fact, you can pre-wire your tree panels for a full matrix and tie blocks together using our Twofers or Threefer adapters. Row Only Effects is another option. Depending on the size of the tree and overall wattage requirements, this is an option for some churches and requires only 1 or two frames. Another option is an Odd/Even Matrix where the lights are layed out on the tree just like in a full matrix, except that all of the odd blocks are tied together and the even blocks are tied together. This allows for a broader variety of effects with only a few frames. For example, with a 9 tier tree, you could use just two frames in an Odd/Even Matrix and be able to do "stripes" as shown here. Although you can't do all of the full matrix effects, there are still lots of nice effects that can be done. An Odd/Even Matrix is also easy to expand into a full matrix later. We really recommend going with a Vertical Matrix (as described above) rather than an Odd/Even Matrix, since more built-in effects can be utilized. 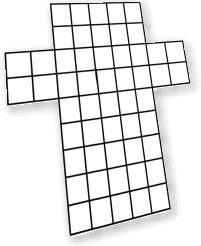 Another possibility is an XY Matrix like was used by Community Christian Church in Yuma, Arizona. This is where a single frame is used as a two dimensional matrix where you have only X (rows) and Y (columns). In this configuration, you don't have multiple colors per block. Other matrix combinations can also be achieved for various layouts depending on the size and shape of your tree. The matrix doesn't have to be a tree either. It could be a Living Cross (see Hyland Heights Baptist Church), star, wall, ceiling, small trees, bushes (see the Daggett's House), set pieces or virtually anything. The 24 channel star shown at right uses a small 4x6 matrix which enables a variety of patterns and effects easily using the MidiLite's built-in matrix features. MidiLite systems can be designed for virtually any size tree. You can also create additional matrix configurations for other elements of your production.